The Joker appears here exactly as he is in the The Dark Knight movie: this Joker t-shirt has the portrait of joker character with the perfectly carved evil smile. It gives this Why So Serious t-shirt a more authentic look. Joker is one of the main villains in the Batman series, which is known to use to joker game cards as a visiting card. In order to make things seem more cool the punch line Why So Serious? Is being written on a game card in Joker’s hand. The Joker t-shirt perfectly represents the chaos and the demonic intentions of the Joker. All the fans of this character will love the product, as they only understand those evil words “Why So Serious?” with that carved out smile. This t-shirt is DC comics official merchandise. The product is the officially licensed from the famous Batman movie – The Dark Knight. The t-shirt is black and high quality 100% cotton. According to the movie and the comic, the character Joker is someone who talks less and does more work with unpredictable plans. The same devil expression is being portrayed on the t-shirt. Trendy round neck t-shirt, which is enriched with Lycra Rib on Neck for extra comfort. 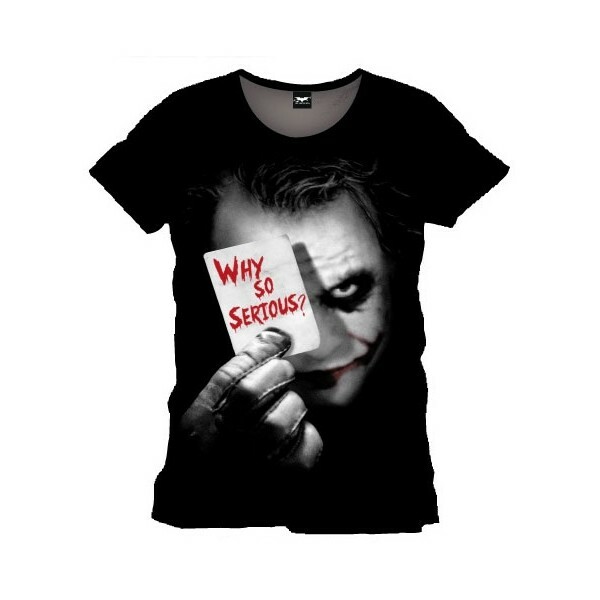 Si vous choisissez de recevoir votre "Joker Why So Serious? 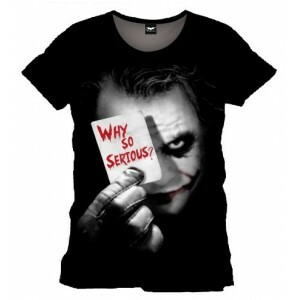 t-shirt from The Dark Knight movie" via Lettre Suivi, les frais de ports seront seulement de 2,95 € ! Votre Joker Why So Serious? t-shirt from The Dark Knight movie est en stock !